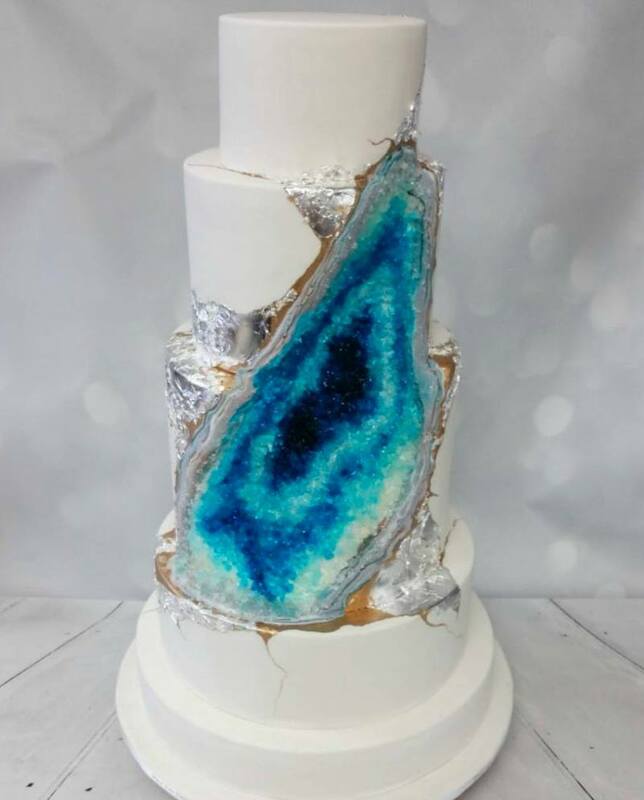 Geode cakes may very well be the most popular trend in wedding cakes since Buttercream was invented. They are EVERYWHERE. 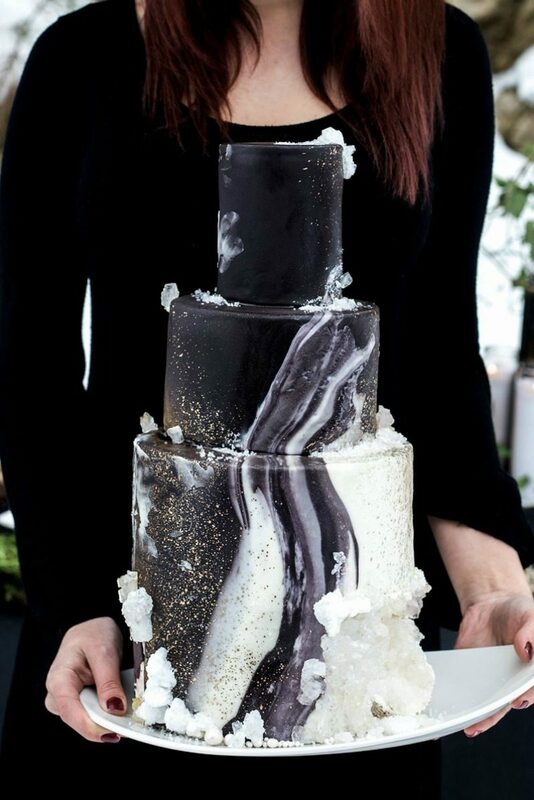 Creating the first sugar geode was the brilliant work of Viki Kane of Just a Little Dessert Co.. Rachael Teufel of Intricate Icings took the idea a step further and buried these babies right inside a cake making for the most breathtaking and unique cake the internet had ever seen. Today we want to show you 12 of these beauties we think are worthy of some extra attention. 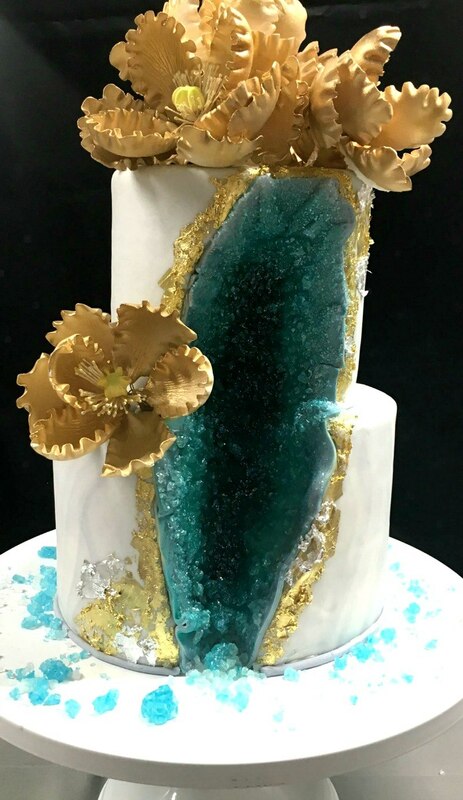 Here is the original geode idea from Viki Kane, the Mother of Sugar Geodes, which if you’re a caker, is pert near as cool as the Mother of Dragons. 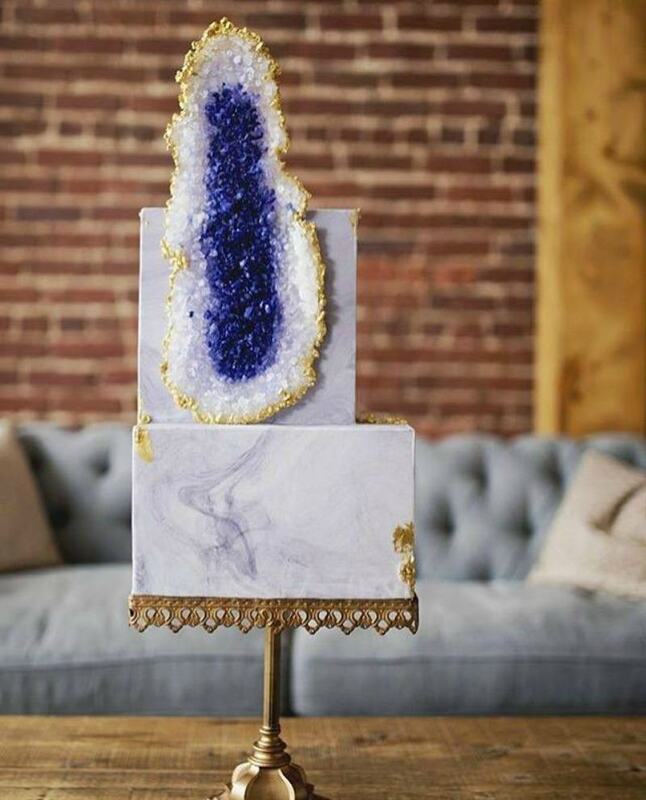 Everyone has seen that first viral Geode Cake of Rachael Teuful’s, but have you seen this one? Are you kidding me?! How cool is the geode hole right through the cake! Bravo again Rachael, Bravo. Cynthia Inguanzo-Underwood executed the geode inlay perfectly here with a beautiful deep sea green. Gawgeous. 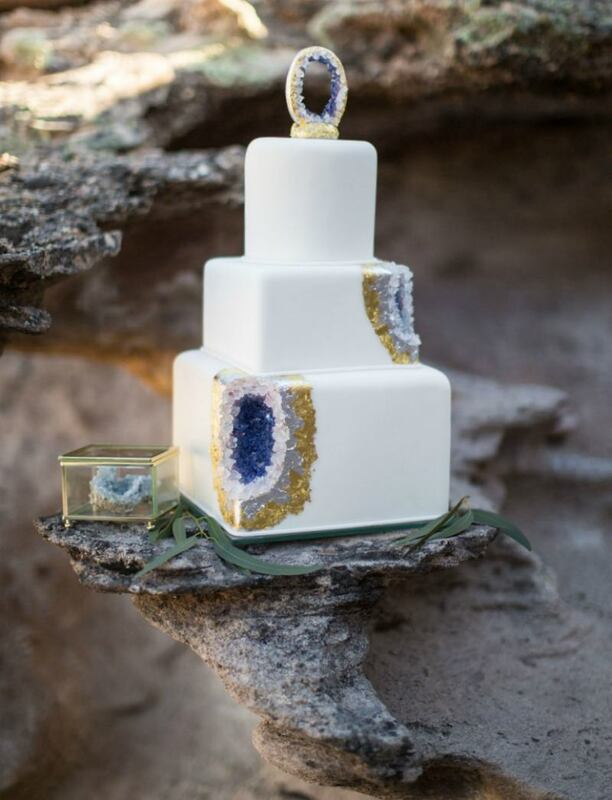 The beautiful blue ring makes this geode cake extra unique and I am also lovin’ the use of both gold and silver leaf around the geode. 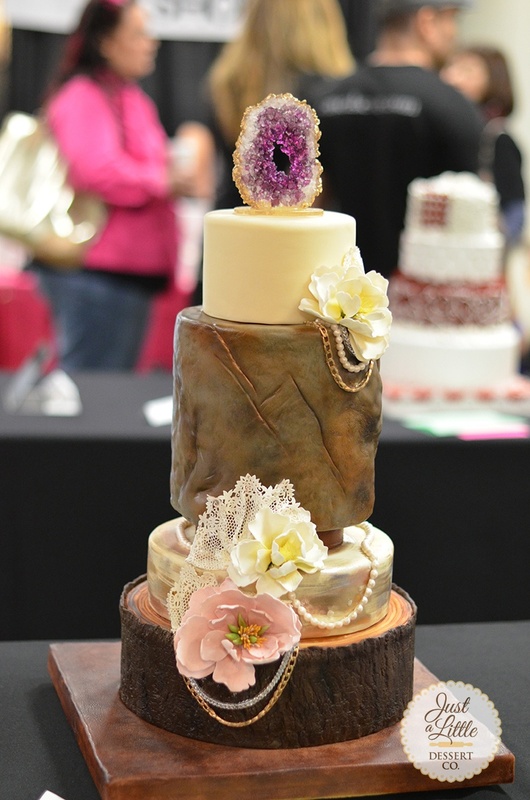 Della Hall of Tastebuds Cakery incorporated geodes unlike anyone else with her hot pink color and use of one to balance the tiers. Mega cool. 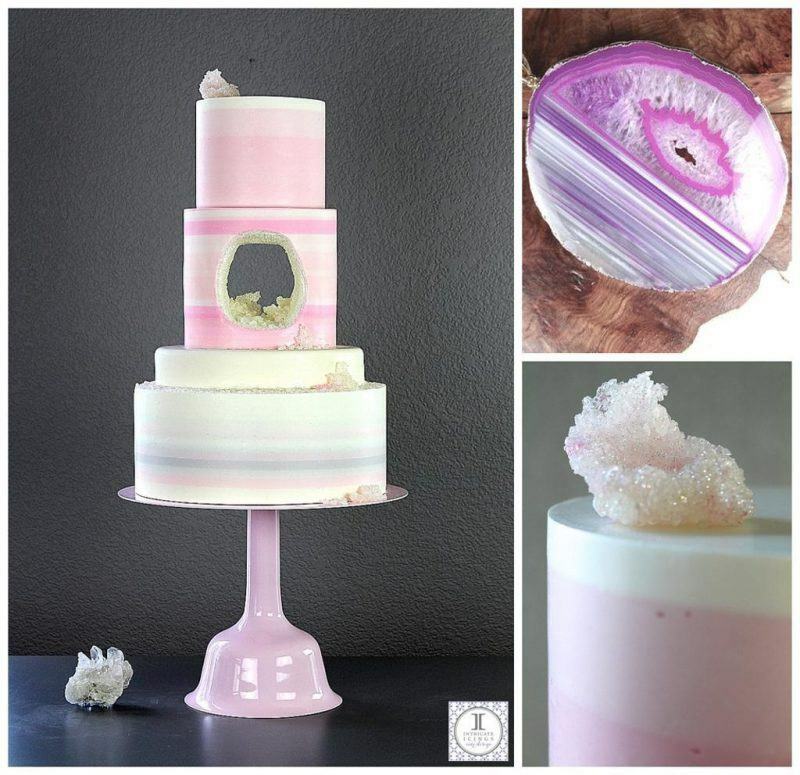 This is another one of a kind geode cake with the geode standing at 16″ tall! 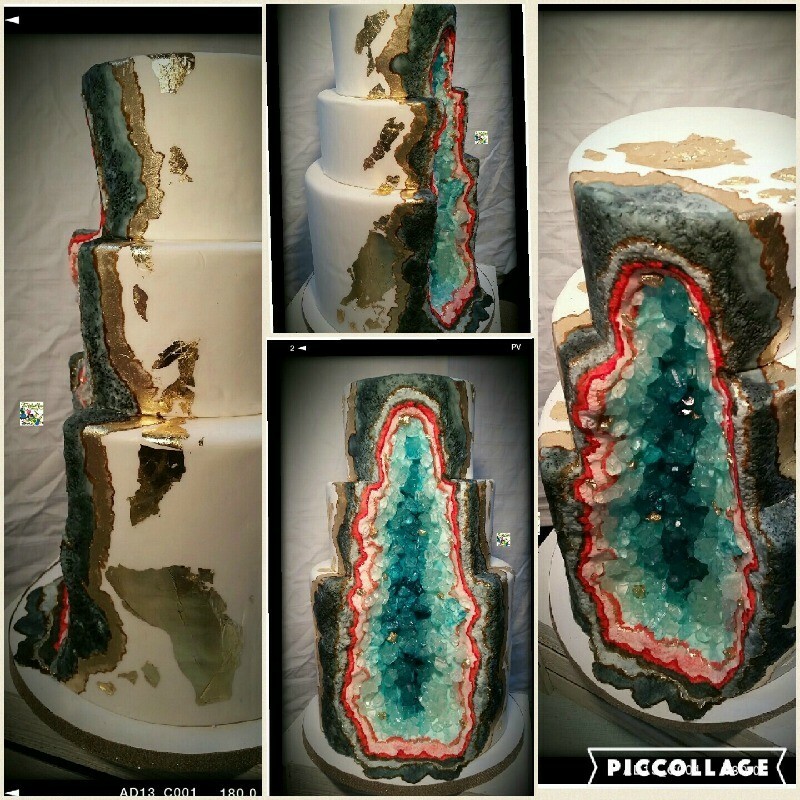 Bree Woody-Stanfill of Vintage Soul Cakes delivered an impressive visual geode experience with this one. 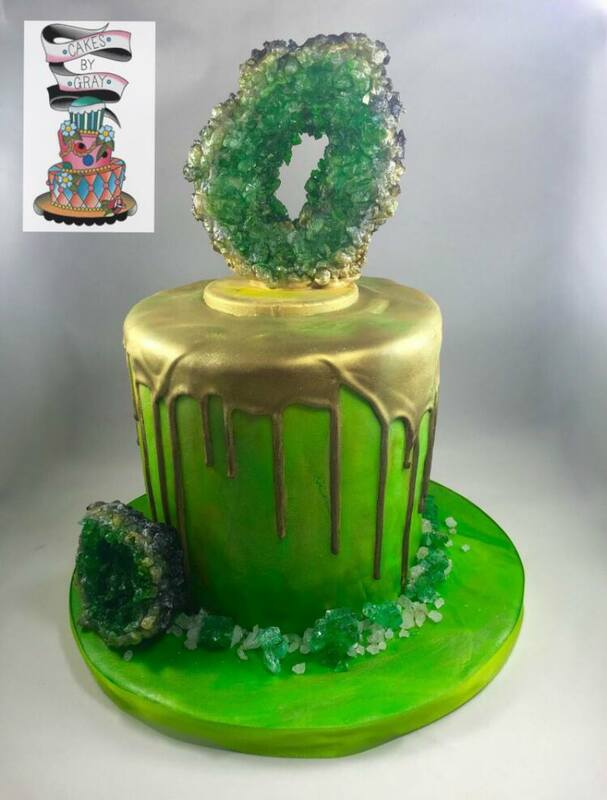 It’s been said about this cake before but it really does take you right to the Emerald City in the Wizard of Oz, and who doesn’t want to go there? Lovely job by Melissa Gray of Cakes by Gray. Christine Leaming of Sweets Geeky Cakes brings us this absolutely stunning black and white marble cake and the addition of the pure white geodes on the outside. Very chic. 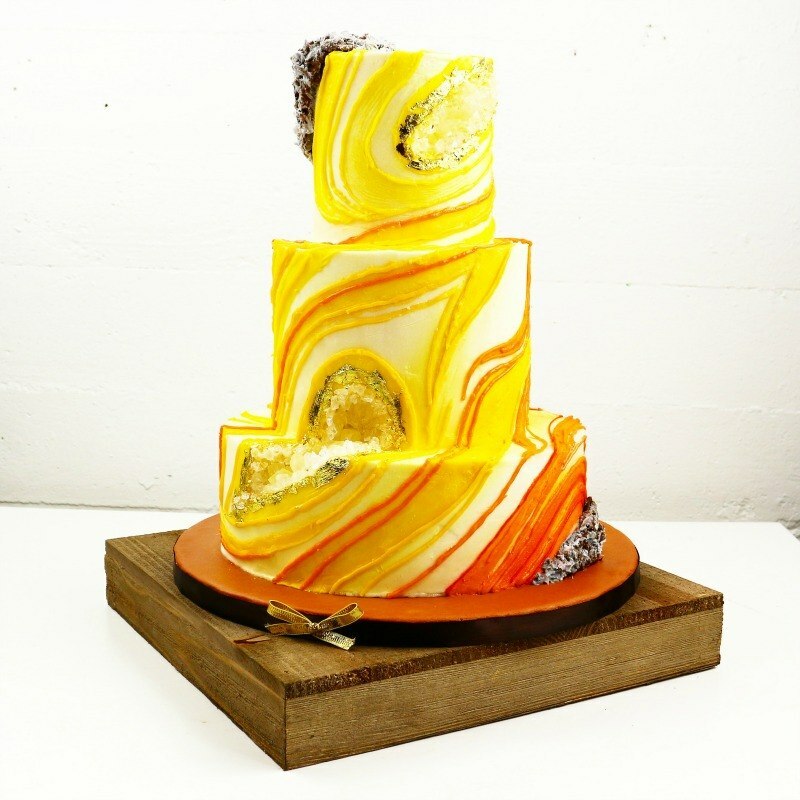 The double colors in this cake by Andi Brown of The Yellow Rose Cakery are freakin’ fantastic! I also really love the realistic rock look around the geode. Not another like it on the internet and you saw it here first. Okay, this is pretty cool. Yellow geodes! So eye catching and to top it off this is a straight up buttercream cake. I really enjoy the small geode additions to the corners of this cake and the fact that it is a desert wedding where geodes are found! Move aside mountain weddings. 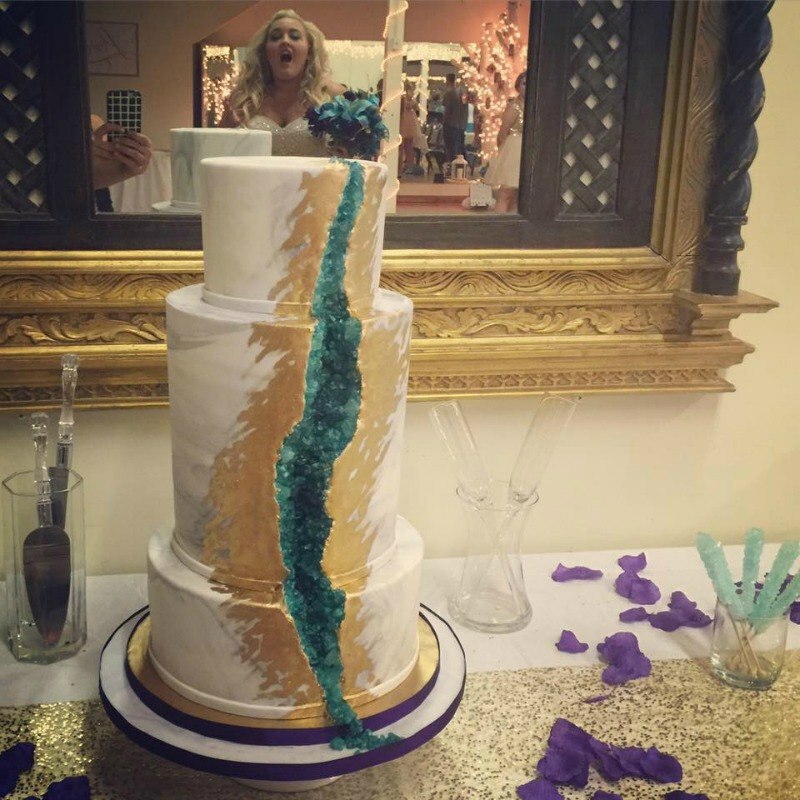 Another beauty with a thin slice of geode from top to bottom but the real winner in this picture is the bride in the mirror, check out her reaction to her breathtaking geode wedding cake! No really, she literally looks as though she is gasping for air. PRICELESS. A round of applause for Sarah Myers of High Five Cakes. 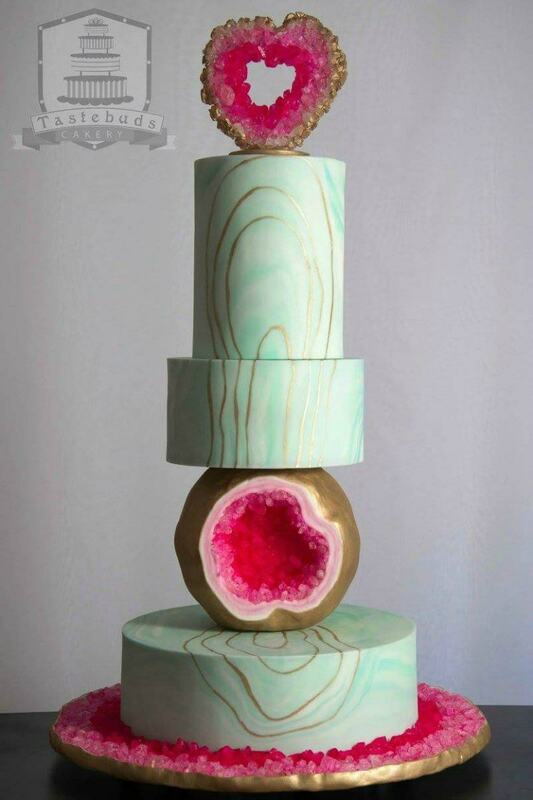 As promised, I’ve shown you 12 stunning Geode Cakes and now I am throwing in a bonus! 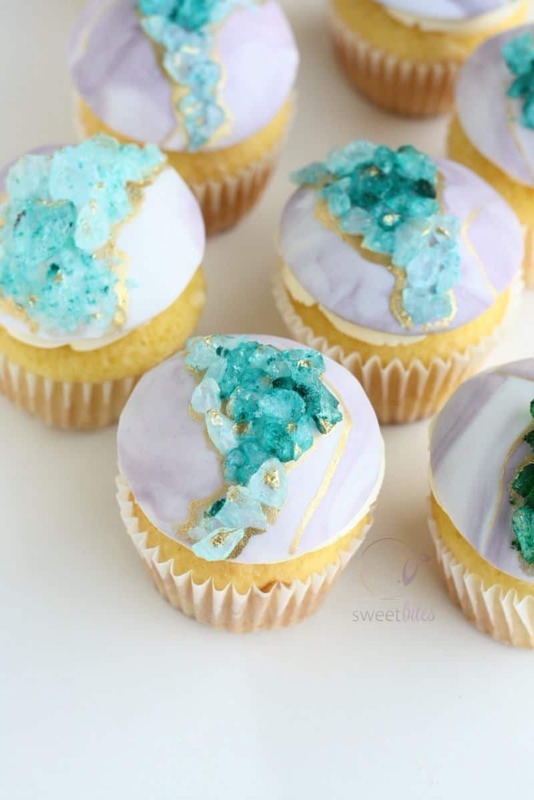 In love with these geode cupcake toppers by Sweet Bites! Are you geoded (I’m making that a word right now) out yet? Of course not because that’s not a thing. We will never tire of seeing these incredible nature meets cake creations. 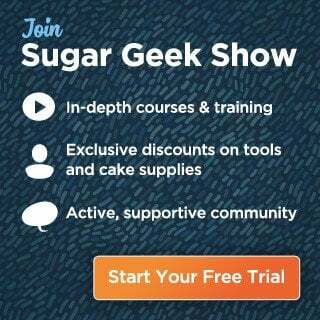 If you’d like to learn how to make some sugar geodes of your own check out the Rock Candy Geode Topper Tutorial we offer from guest instructor Viki Kane herself as well as the Geode Love Cake Tutorial from one of Liz’s inspiration shoots.